Okay, so I was planning on only posting the image I created with my quote and reminding everyone to have a safe and happy holiday, but then I had such a great night that I thought I’d talk about it. 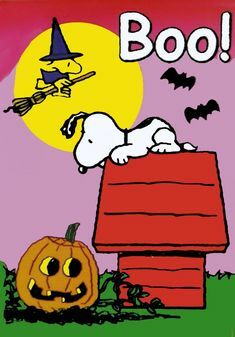 First, let me tell you guys that I hope you all had a great Halloween and continue to if you’re still celebrating! So before trick-or-treating started, I decided to write a Halloween story. I’m not really one for writing short stories, but I actually wrote one and while I haven’t re-read it yet, I think it’s pretty good. Anyway, after I finished that, it was pretty much time for trick-or-treating, so I put the candy in the bowl and got ready. Usually a lot of kids don’t show up right away, but they did. I felt way more relaxed than usual when giving out candy and didn’t have to take as many breaks. I get really excited about Halloween (some people in my house think a little over-excited) and I like to protect the candy from getting in the hands of anyone except the kids who are supposed to be the ones getting it (i.e. I try to protect it from my brother!). Anyway, I’m so happy that in addition to enjoying giving out candy, I was able to do it with minimal anxiety. I remember that last year, while I was giving it out, there were times when I felt a little too anxious to keep getting up, but this time, I got through it a lot better. I’ve always loved Halloween. My dad used to take me when I was little so I have a lot of good memories (though I always hated those smoke machines. For some reason they scared the heck out of me!). The only thing I would change about the holiday is that I think more people should walk with the kids rather than driving around, but I guess they don’t feel safe enough to do so, which is a shame but sometimes how it is. Anyway, I had a great Halloween and hope that everyone else did and continues to as well! First, I’d like to wish everyone a Happy Halloween (I’m actually writing this the night before, but hopefully by the time you read it, it will be Halloween!). Anyway, I hope that everyone has a safe and fun holiday! Okay, so while today isn’t totally a good day (my Grandma passed away on this day ten years ago), today has gone really well. First my mom and I went to the cemetery to visit my Grandma’s grave where my anxiety was minimal and then we went to eat together, where I think I’ve been the least anxious in a long time going out to eat! It felt amazing! 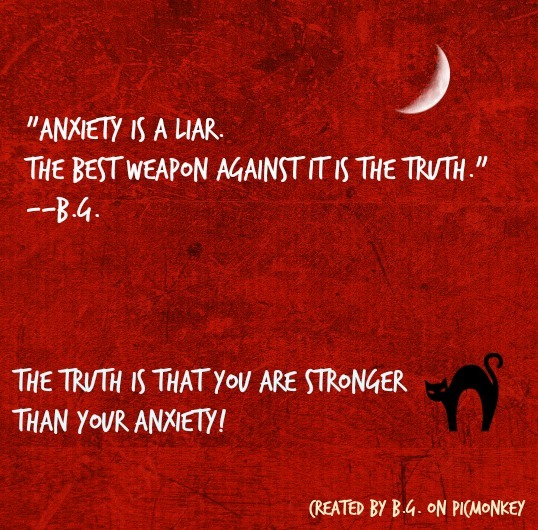 I kept telling myself when I felt a little anxious that, “Anxiety is a liar. The best weapon against it is the truth!”–B.G. The quote really helped me. I remembered all the times in my life when I’ve gotten through things and haven’t allowed anxiety to get in the way, like when I was in high school and younger or when I was in college before my anxiety really hit. I also reminded myself that even now there are lots of times when I don’t feel anxious or I manage to get through my anxiety. I’m not saying that I did perfectly today, but I did an amazing job and I’m super proud of myself! What did this great experience show me? It showed me that I’m stronger than my anxiety and that I can get through it. It showed me that anxiety doesn’t have to control my life and that I can be happy! A part of me believes that my Grandma was really looking out for me today! So I would like to thank Stephanie over at Stephellaneous for extending the challenge to come up with three quotes for three days. Thanks to her, it made me think of more quotes about anxiety. Here is one I came up with myself! I hope you all enjoy it and that you find it helpful! Please check out Stephanie’s blog! So I know I told you guys about my new plan to set alarms to remind myself to practice facing my anxiety by stretching and anxiety. I don’t mean to sound like a walking-talking iPhone commercial, but I’ve found the Reminders app on my phone really useful. Yes, I admit that sometimes the little alarm goes off and I say to myself, “I’m so not in the mood to exercise”, but then I realize that I need to push myself and I get things done! So far this method is working really well and I recommend that any of you who have a hard time keeping up with your exercising, start setting alarms and trying really hard to follow through with your progress. It’s a great thing knowing that you’re getting things done! After seeing yesterday that I didn’t do much practicing and exercising, I realized that I have to make more of an effort. So last night, I made a schedule on my phone along with alarms, to make sure that I practice at the times that I want to. I have to admit that when the first one went off, I fell back to sleep. I was tired and it didn’t take long to doze off. However, when the second one went off telling me to do another exercise, I decided to get up. Was it easy? No. Was I tired? Yes. However, I realized that whether or not I wanted to, I had to get up and practice because getting through my anxiety is important to me. I’m hoping that by making a schedule and setting these alarms, that it will keep me focused on my goals. Too many times I find excuses not to stretch and exercise. Whether it be because I’m tired, forgetful, or just lazy, I end up not practicing like I should. I also have a bad habit of doing really well with practicing for a while and then all of a sudden, winding down. The problem with this is that anxiety isn’t always so patient and cooperative. Anxiety doesn’t stop and say, “Well she/he doesn’t feel like practicing today, so we’ll give her/him a break.” I’m sure many of you have noticed this. Anxiety doesn’t tend to take our feelings into consideration. If it did we wouldn’t be battling with it in the first place. So if you find yourself struggling to keep up with practicing to get through your anxiety, find a way to further motivate you and help you along. If you keep forgetting to stretch and exercise (some people wonder how you can forget, but trust me it’s possible. Just because we want to get through this, doesn’t mean we can’t forget to take the steps to do so. ), set alarms or write yourself a reminder and put it somewhere you will keep seeing it. If feeling lazy stops you from practicing, remember the importance of getting through your anxiety and other obstacles and how being lazy won’t get you anywhere. Now if you’re sick, not feeling well, or have been told by a doctor to rest, take these things into consideration. If you’re not feeling well, perhaps you shouldn’t exercise as much, but still try to do as much as you can. If a doctor tells you to rest, ask them if you can still do some light stretching/exercising. Don’t give up, you will get through this if you keep trying on a consistent basis! I just started following Phoenix Crimson’s blog and thought I would participate in this cool tag! Favorite Candle Scent: I’m not really a candle person, but I’d have to say Vanilla. What is the best fall memory you have? Hmm…this is hard. I guess maybe when I was younger and went Trick or Treating with my dad or when I went to my friend’s house for Halloween. Best Fragrance for Fall: Does Vanilla count? Candy corn and Vanilla Caramel too. Favorite Thanksgiving Food: Stuffing! I hate turkey by the way. Most Worn Sweater: Hmm…I don’t know, I have many. I do wear my leather jacket a lot in the fall though. Football games or jumping in leaf piles? Neither really but jumping in leaf piles! Favorite Type of Pie: Apple. I don’t like pumpkin. What is autumn weather like where you live? Breezy and a bit chilly. Which makeup trend do you prefer, dark lips or winged liner? Neither. I don’t really wear or like makeup. What song really gets you into the fall spirit? Uh…I have no idea. Is pumpkin spice worth the hype? No! I don’t get it at all! I don’t really like pumpkin anything though, so that’s probably why! Favorite Fall TV Show: At the moment, Limitless. Skinny jeans or leggings? Neither, I like flares and only flares! Combat boots or Uggs? Don’t know. Halloween – Yay or Nay? Yay. However, I’m a huge believer that Halloween should be parents walking with their kids and not riding in cars. I’m sorry, it’s just how I feel. If it’s too dangerous, then you shouldn’t go at all. However, I think in general, it’s not that dangerous. Fall mornings or evenings? Mornings and mid days. What do you think about Black Friday? I’ve never really gone Black Friday shopping but I feel it’s way overrated and that people that trample over each other for deals are insane. I would like to nominate anyone that would like to answer these fun questions! If you’re someone who struggles with anxiety and know what it’s like to not have struggled as much in the past, you have probably experienced moments of sorrow when looking back on the times when you were happy and didn’t over-think almost everything under the sun. You may feel saddened when you remember that once upon a time anxiety didn’t seem to control your life so much. While focusing on the past can definitely prove to be a negative thing, it can also be a positive thing. For example, I know that I have the ability to do certain things, even if anxiety oftentimes makes me feel otherwise. How do I know? I used to do them all the time without even thinking about them! Also, there are even times now where I see myself doing every day things without feeling anxiety. 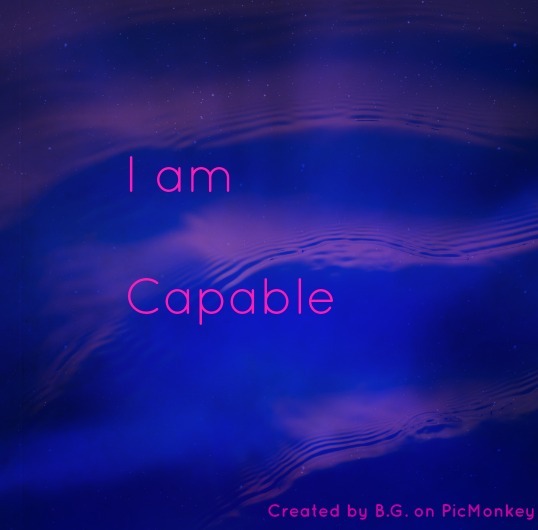 So, yes, while there are many times when I feel unable to do things due to my anxiety making me feel that way, I know that I am capable. It may make me sad to think that once I didn’t feel so anxious and now I do, but the past still helps me remember that I am able to do so many of these things, even if my anxiety often tries to trick me into thinking otherwise. What does this all mean? This means that instead of spending our time feeling sad about our past and how we once didn’t feel as anxious, we should use the past to both motivate and teach us. For example, don’t you wish you could be free of anxiety again or not worry as much? Maybe in the past you didn’t worry as much and you were happier. Use these memories of happiness to motivate you to try harder. Also, remember that you are still capable of getting through your anxiety and doing things without feeling anxious, you just need to retrain your mind. I know this isn’t always easy, but I really do believe that with practice, it is possible! Some days our anxiety is really difficult to get through. 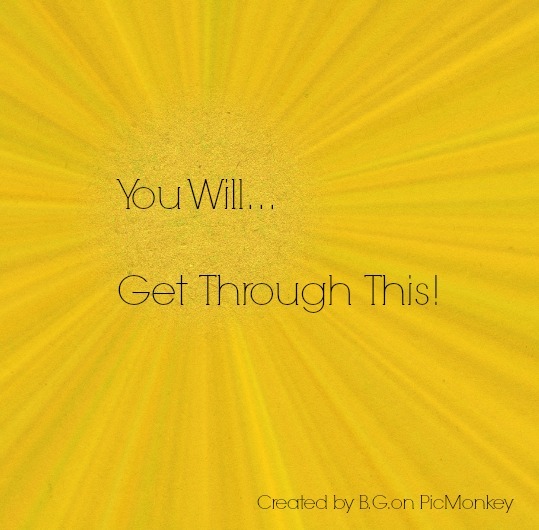 Our day may be going fine and then we experience a moment of anxiety or a panic attack that seems to take over the rest of our day or at least a much bigger part than we would have hoped. We may even hear the often heard words of someone saying, “Just go and do what you need to, it’s not that difficult”, when really to us, what we need to do seems impossible. I’m embarrassed to say that I’ve experienced this and I actually just went through it about an hour or so ago. Something that should have been really simple for me to do caused me a great deal of anxiety and before you know it, I was feeling a great deal of panic. My dad who I love and who supports me the most out of everyone I know got frustrated and without really wanting to, made me feel guilty for struggling so much. I was admittedly frustrated to and as much as I wanted to just tell myself that I was stronger than my anxiety and get up and do what I had to, I didn’t feel like that was working. I didn’t feel like I could just get up and do what I had to. As I mentioned before, when it comes to anxiety, the Nike slogan of “Just do It” doesn’t always seem to cut it. One thing that I did forget in the moment though, was the good piece of advice I just recently read. Now, do I think it would have instantly cured all my problems? Probably not. Do I think it would have helped? Maybe a little. So why do I think this is such a good piece of advice? This is why. Anxiety is always causing us to doubt ourselves. Anxiety is overwhelming and because of this trait, it can cause us to feel much weaker than we actually are. However, we need to try and stop thinking so negatively and think the other way around. This may not be easy, but once we start telling ourselves positive messages and showing ourselves that we are capable of getting through our anxiety, we will have more and more proof that we really are stronger than our fears. I’m honestly not writing this so that you go and read Jewel’s book, I honestly don’t care if you do or not (what I mean is, I’m not trying to make you buy the book. Nor am I trying to advertise for Jewel!). I’m telling you this because I found this piece of advice helpful and think it makes sense. I think, for me, anxiety is always making me feel incapable of getting through my anxiety, when really, I know deep down that I am capable. If you do check out Jewel’s book though, make sure you check out the afterward. I honestly skimmed the majority of the book but found the afterward really helpful and inspiring. 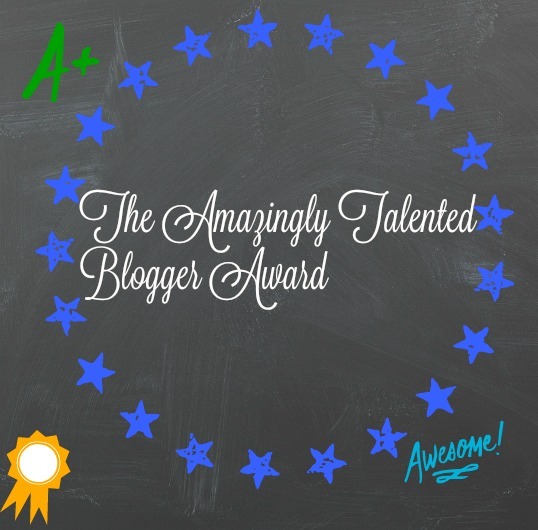 The Amazingly Talented Blogger Award! I decided to take it upon myself to create another blogging award, The Amazingly Talented Blogger Award. I was making a list of all the bloggers and blogs that I wanted to nominate, when I realized how every blogger I follow is extremely talented and to leave anyone off the list would just be wrong! So to all the people that have ever read, commented on, “liked”, or followed my blog, thank you and I give you this award! I especially want to send a special shout out to the newest blogs I’ve discovered and started following! 1.) Nominate people that you think are amazingly talented! I’ve nominated all of you guys! 2.) Let your nominees know in what way they’re so talented. All of you have so many unique talents. You are all however skilled at writing, along with brave and strong for have started your own blogs and shared your stories. If you’d like, you can answer these questions! I’m actually going to answer them to since I find them fun! 1.) If you could improve one thing about yourself, what would it be? I’d be better at getting through my anxiety. 2.) What is your number one goal in life? To get through my anxiety and not let it control me so much. 3.) What’s your favorite thing about yourself? 4.) If you could meet any author, who would it be? 5.) Can you remember the first concert you ever went to? What was it? 6.) If you were stuck on a desert island, would you rather have books or a portal DVD player with batteries and DVDs (yes I realize the odds of having these things would be slim!). This is tough and as much as I love reading, I might have to say watching DVDs…of course the batteries would eventually die. So I guess, books…? 7.) What do you think makes your blog awesome? I get to help myself and hopefully others at the same time. I like them in the order they came out honestly! I hate when in the last one though, Doc’s girlfriend says “Golly” on the train and when she gives him that speech about how he must take her for a fool about how he can travel in the future. Her voice gets so annoying!